I can hardly believe that my summer internship is coming to an end. It's been a truly amazing and hands-on experience; no fetching coffee here-- I've been a regular part of the team, which has been so great! It has further confirmed that this is the right career path for me and I LOVE going to work every day. 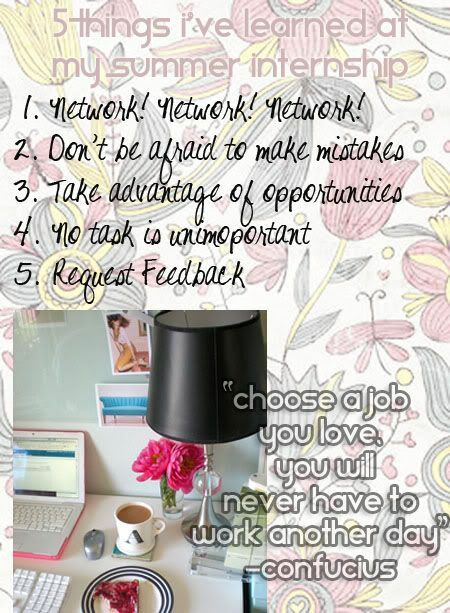 1.Network! Network! Network! Get to know everyone at the company (including interns-- they're you're future co-workers). Add them on LinkedIn & keep in touch post-internship. The connections you make can help you get hired or find out about job leads (so never burn any bridges)! 2. Don't Be Afraid To Make Mistakes. I'm quite the perfectionist and it's taken me a while to adjust to the idea that things can not always be perfect. Making mistakes is expected & normal and learning from them is part of the process. There are no such thing as stupid questions, so ask them! 3. Take Advantage of Opportunities. Internships offer you the chance to see the dynamics of how all the departments within a company. Take advantage of your surroundings as an opportunity to shadow other people in the company and find your true passion. For example, I've attended meetings with Technical Designers, Product Development, Sourcing, and Marketing! 4. No Task is Unimportant. Truly, every task is important for business to function. Everyone has to start somewhere! Even if you're filing papers or pulling samples find an opportunity to learn something from the situation and maintain a positive attitude. 5. Request Feedback. You don't know how your doing unless you ask! Your mentor only wants to help you reach the career goals you want to achieve.. they've been in the business a lot longer than you have. So, ask them what you need to be doing to be successful! I feel like I've learned more than I ever thought possible & learning is an ongoing process. I'm so grateful for this wonderful experience! I came here knowing no one and with no corporate experiene.. and it's definitely been a memorable & fun filled summer. & Check out a vintage post at LPF about fashion internships here! I'd love to hear where everyone has been working this summer & any words of wisdom about internships & entering the work force! this is an excellent post! great advice. to take advantage of every opportunity. I'm (hopefully) going to be interning next summer in a fashion journalism field and I can't wait! or venture to NYC, though. I'm also looking into journalism internships through the AIU program in London. Man, being a big girl can be scary scary! Such decisions! Great tips! I'm looking into getting a writing/production internship next summer at one of the studios here in LA -- a bit of an intimidating industry but I've gotta start somewhere, right? I liked a lot this post, tnx for the tips and the confucius's phrase is so true! Great tips: thanks. I agree, networking is so important! One thing to add: make friends with the other interns! They are the best connections and make the summer super fun! !